On 22nd June, Sachan was found dead inside the Lucknow district jail hospital. Dr YS Sachan, Deputy Chief Medical Officer of Lucknow and the main accused in the high-profile murder of his two senior colleagues, and was arrested for hiring sharp shooters to kill Singh and Arya. The mysterious nature of Dr Sachan's death has shaken even the inmates who spent the past few days with him. "On a normal day food is served at 6:30 pm. That day it was served at 4:30 pm. After that we were forcibly locked inside and were not allowed to even go out to get water. Everyone was talking that someone has been murdered. Even the policemen were talking the about the same thing. It was not a usual day in jail. I was released a day after that incident," said a prisoner. Besides the political opposition, the kin of Dr. Sachan have come out publicly criticizing the Mayawati government and demanding a CBI probe into Dr. Sachan's death. Dr Sachan's elder brother DR RK Sachan said that his brother was not the kind who would die like this. He also raised fingers on the government's version that Dr YS Sachan had committed suicide. "No sucide note was found... then the authorities have changed their statement several times... no one is able to explain categorically as to what happened.. Only a CBI probe can bring out the truth," said Dr. Sachan's brother. Dr Sachan is survived by wife Dr Malti Chowdhury, also a government doctor in UP posted in Lucknow, son Sankalp and daughter Manvi. The government doctor was in the police custody for plotting the murder of his colleagues Dr. Vinod Arya and Dr. BP Singh. On Oct 27, 2010, the Chief Medical Officer (CMO) Family Welfare, Dr Vinod Kumar Arya was shot dead in Vikasnagar's sector 14 by some unidentified assailants. Dr Sachan, who was the deputy CMO, was asked to take charge as officiating CMO till a regular appointment was made on the post. In March, 2011, Dr BP Singh was appointed as the CMO. However, he was also shot dead by unidentified assailants on April 2, 2001. Dr. Sachan was arrested on June 10. He was accused of swindling funds sanctioned under the National Rural Health Mission. The police had claimed that Dr. Sachan got the two CMOs killed because they threatened to expose him. The news shocked family, friends and colleagues and swung the government machinery into action. ADG Jail, VK Gupta said that prime facie, the death appears to be a case of suicide. A judicial probe was also ordered in the matter besides a panel of doctors was selected to conduct a post-mortem of Dr. Sachan's body. Colleagues have been taken aback by the incident. Government Doctors Association, president Dr DR Singh said, "We are left numb... this is shocking." He was suffering from heart ailments and was under treatment at the jail hospital. His body was found hanging in the bathroom with a belt around his neck. The police is investigating how Sachan got a belt because items like belt are not allowed in jail. 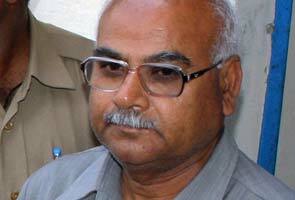 Dr. Sachan's death gravely jeopardized the police investigations aimed at resolving the murder of the two CMOs. According to the postmortem report, his body bore eight incisions and death was caused by excessive bleeding, said a police officer. The ligature mark on the neck was caused after his death. The incisions were found on both sides of his neck, forearms and groin. The incision on the right side of the neck is 6 inches deep and the one on the right groin is 9 inches deep. These cuts were possibly made with a surgical knife, said an official who was among the first to examine the body. “A person cannot cause such deep cuts on his own body," he said. All the political parties in the opposition have united to condemn the government over the mysterious death. "The judicial probe appears to be an eye-wash... this is only a way to hush up the matter," senior Congress leader Digvijay Singh told reporters a short while ago. Like Samajwadi party, Bhartiya Janta Party and others, Congress also demanded a CBI probe into the case. Samajwadi Party state president Akhilesh Yadav had said that Sachan was killed to "save some big fish in the BSP government." The SP has also started a state wide agitation against the total break down of the law and order and bad governance.